The North Dakota Well Driller’s Association grew out of a great need, the need for better conditions in the well drilling business. The need of better knowledge of the business and greater cooperation among neighboring well drillers is probably general throughout the United States, at least it was through all the great agricultural region known as the Middle West, but so far as known no attempt had been made to meet it until the organization of this Association. 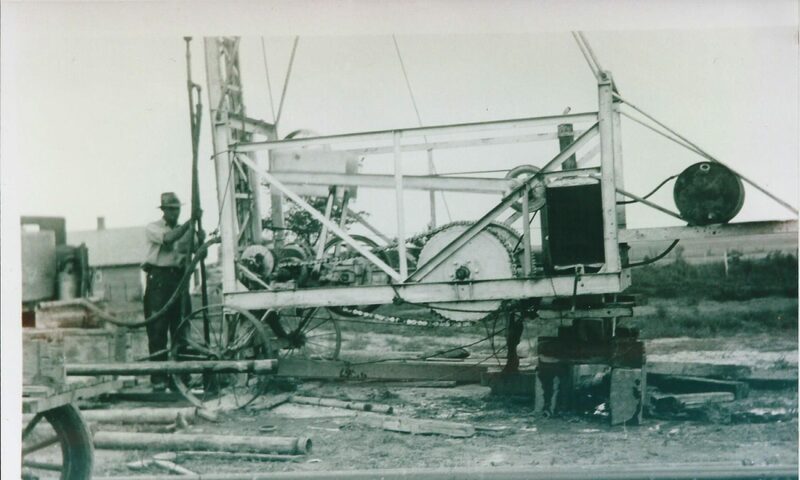 The conditions which made the organization possible grew out of the work of the North Dakota Geological Survey with the well drillers of the state. For four or five years, the writer, then Assistant State Geologist, had been making a survey of the ground waters of North Dakota. This study of the occurrence, quantity and quality of the ground waters of the state, included the relations of the geological formations, climate, topographic features, water bearing horizons, artesian conditions, and the mineral content of these waters. In this survey, the entire state was traveled over by rail, automobile, team, horseback and on foot, scores of well drillers were personally interviewed, hundreds of wells were visited and thousands of letters and blanks were sent out to drillers, well owners, and others who could give helpful information. In this way a mailing list of over 500 drillers was secured. The interviews and correspondence awakened the interest of the drillers and resulted in their hearty cooperation in the work of the Survey. The exchange of information has been of mutual benefit since a large amount of authentic geologic information was received by the Geological Survey, and a very considerable regular correspondence grew up between the drillers and the State Water Geologist through all of which was shown a desire and a need for better information regarding geological formations, the occurrence of water, and the methods of drilling and finishing wells. This information was supplied through correspondence as far as possible, hundreds of letters of advice going out to drillers annually and many books and pamphlets were given or loaned, but some drillers came to the office in person for information. It was during an office call of this kind by Mr. A.L. Brown and Mr. E.W. Eaton, neighboring drillers resident in Grand Forks, that Mr. Brown asked if they could not have some assistance in getting a few drillers of the locality together in order that they might, through better acquaintance, become better friends, cease bickering and jealous interference, and learn of one another’s problems and their solutions, and also receive instruction regarding the geological formations and the occurrence of water in them. The value of the suggestion was greatly appreciated and after consultation with the Secretary of the Commercial Club of Grand Forks, a letter of inquiry dated April 6th, 1915 was sent to a number of the leading well drillers of the state, and the response was so favorable that a call letter for the first meeting was sent out on May 11th following. This letter was sent to all drillers of North Dakota, so far as known, inviting them to a meeting. Later, through the courtesy of the Grand Forks Commercial Club, tentative programs were also sent to the complete list. The “Sludge Bucket”, a trade paper published by the Sparta Iron Works Company of Sparta, Wisconsin, gave space to the complete call and program and out of all of these combined efforts the first meeting was held in the Commercial Club Rooms, Grand Forks, on June 2nd and 3rd, 1915, with thirty-five well drillers in attendance. Since the initial meeting, annual meetings have been held at Devil’s Lake in 1916, Minot in 1917, Bismarck in 1920, and Grand Forks in 1921 and 1922. (Editor’s note: and many more since this article was written) The meetings of 1918 and 1919 were omitted owing to conditions arising out of the war. In each of these meetings the program has been planned and directed by the State Water Geologist with the Extension Division and methods which have been found useful to them. Manufactures of established reputation have explained the latest improved tools and machinery and supplies. Experts have demonstrated standard rigs and working models. Dinners, with good speeches, songs and readings, popular illustrated lectures upon radio and liquid air, and even the movies have lightened up the otherwise rather solid production of the University cooperating. Members of the University and Agricultural College facilities have lectured upon topics helpful to the work of securing the best available water supply. Drillers of long and successful experience have discussed many of the practical problems of making wells, and have given talks and demonstrations of devices, tools, grams, and above all, the drillers have had good social times in which to rub elbows with neighbor drillers and swap experiences with those from far corners of the state. Business occupies a minor portion of the time of the Convention and never in its history has the Association attempted to fix the prices of drilling. 1. A better understanding of the occurrence, quality and quantity of the underground waters. 2. A better knowledge of the work of drilling, casing and finishing wells. 3. A better relation between drillers and their employees and between the drillers themselves. 4. A better income through steady work, greater success in securing an abundance of good water and satisfied employees. Drillers, helpers and all others who are interested in well drilling from any standpoints are invited to attend and take part in the discussions.